This article was originally written by Pia Poulsen in 2010 after she learned about the altar, the four directions and the Medicine Wheel from Jenny Ray. 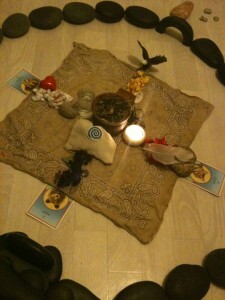 Each tribe and even clan have their own version of the Medicine Wheel and how to lay an Alter and tie Prayer Ties. It doesn’t really matter which version you follow or if you even make up your own. The Medicine Wheel is used as a focus for prayer and intention, a symbol for communicating with Creator or just to clear your own mind and meditate. What I share below is from the teachings I learned from my Stone Medicine course taught by Jenny Ray. As with all things, take what you can use, adapt what needs adaptation for your truth and leave the rest be. Just keep the intention and purpose in mind and there’s really not any wrong way to lay an alter or say prayers. Upon a cloth in the centre is placed a shell or bowl with sage or another herb. It is lightened and the smoke is what carries the prayers to Creator, as well as cleanses what you place on the alter. The centre is the connection to Mother Earth and Father Sky. Symbolism for the animals can be placed here as well. The herb for the rooted ones, the shell for the swimming ones, some protective skin or antler for the running ones, the smoke for the flying ones and so on. The most important is that it speaks to you. In the four directions are placed their elements and their guardians, and any object you wish to imbue with energies of that direction. Prayer Ties are also placed on the axes of the directions, targeting the prayers to that area or intention. East for the fresh breath, for new beginnings, dawn and birth. East is guarded by the Eagle who carries our prayers up to Creator. The lesson of the East is to live in this moment – like the Buddhist mindfulness practice. The breath of yesterday is gone, you can’t breathe it again. And the breath of tomorrow you don’t even know if you will have. So you breathe in this moment for that is all you have. South is for the family, abundance and growth. It’s the direction of summer, warmth, fire and sun. This is the direction of our ancestors when they teach us; as the parents teach their children. Guarded by the dog family, south is the direction of playfulness and exploration. Of children growing into adults. West is for fall and the evening, the Bear going into her den to wait out the winter season. This is where we go into ourselves to dream and vision, to work out our issues and discover ourselves. Here we bury the things we no longer wish to carry, our worries and fears, our pain and hurt, our disappointment and anger. In the west we contemplate and store the harvest of summer. North is for wellness and healing. The cold of the winter which kills diseases. This is also the direction of the spirit realm and those who has passed over. Here you find the teachings from White Buffalo Calf Woman who brought the Pipe and ceremonies to the People, to teach them how to facilitate wellness and healing. A bit of tobacco is placed on a small square piece of cloth, of the colour for the direction it will be placed in. Using a single string of thread, or a string of hair, a knot is securely tied around the cloth creating a small bag in which the tobacco is kept. While tying the string, the prayer is said, either spoken out aloud or to yourself. Tying the knot finalizes the prayer, giving it a firm conclusion and statement. Each Prayer Tie has a prayer. And several Ties can be made for just one direction to cover different things. The prayers can be about one topic for all four directions, or different topics. It is all up to you. The Sacred Herb for the Prayer Ties is tobacco as it holds a special meaning to the Native Americans. Tobacco is said to carry the words and prayers directly to Creator. One reason it is so special is that the tribes had to trade for it across the North Americas. This required that they could meet peacefully and communicate even if they didn’t speak the same language. As a result, a sign language was developed – thereby giving tobacco communication attributes. It is important to keep the Spaces in Between free for items. They are more sacred than the directions, though more vague. In the wonderful logic of Jenny and the natives: Creator created all those spaces in between – we have more space in between than we have matter – so obviously it must be very important to Creator even if we have no clue as to why. It is in the Space in Between where true change happens. This is when growth happen. Children grow when they sleep, when they are in between days. The time in between Winter and Summer is Spring, when the world come alive and new life is born. It is in the spaces in between that we have time to think and reflect, to work through our challenges and come up with new solutions. The Spaces in Between are the moments were we pause and just are. When we are in the moment.